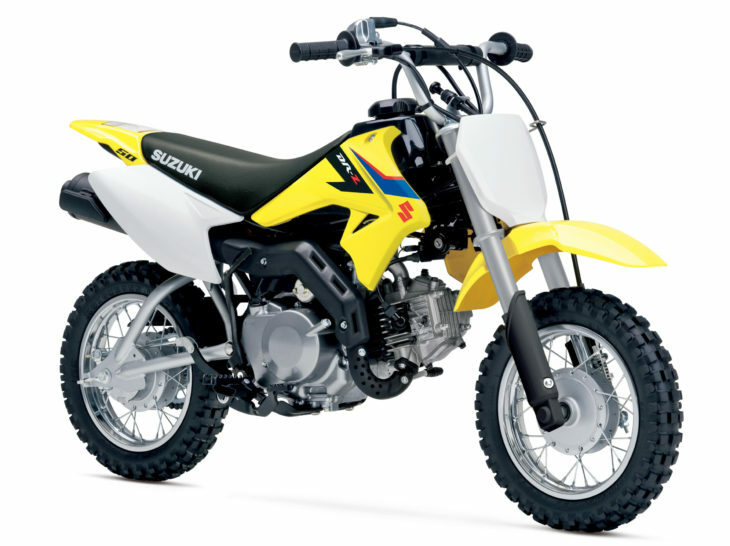 Suzuki announced earlier today the introduction of a new 49cc, four-stroke dirt bike for children … the DR-Z50. With electric start (backed-up by a kick starter), the new machine features a three-speed transmission with an automatic clutch. Suzuki is emphasizing adult control here, so a key is required to start the bike, and peak power can be limited by an adjustable throttle limiter. U.S. MSRP for the 2019 DR-Z50 is $1,749. You can find more details in Suzuki’s brochure on the new 2019 DR-Z50. Suzuki used to make a DRZ70 that was the same size as the Honda and Yamaha 50s. It had electric and kick start. It was also the only bike in its class madebin Japan. Why would they downsize? They had the best kids bikenon the market! Save the hate for bikes that deserve it. My son had a Yamaha TTR50 with e-start. Kicker was a $350 add-on. All the 4 stroke bikes in this category are not serious trail machines, and no one is going to pay $3000 for a “high tech” 50. These are starter bikes, and we all know the drill. Someone buys it, resells it 2-3 yrs later … process repeats until the bike is a total POS; price flattens out to $500 by the 3rd/4th buyer. Only KTM makes a 50cc 2 stroke racebike, and it is more of a CRF125, TTR125, or KLX140 killer; not a starter bike. I grew up with only a local Suzuki dealer. DS100 was my first bike. 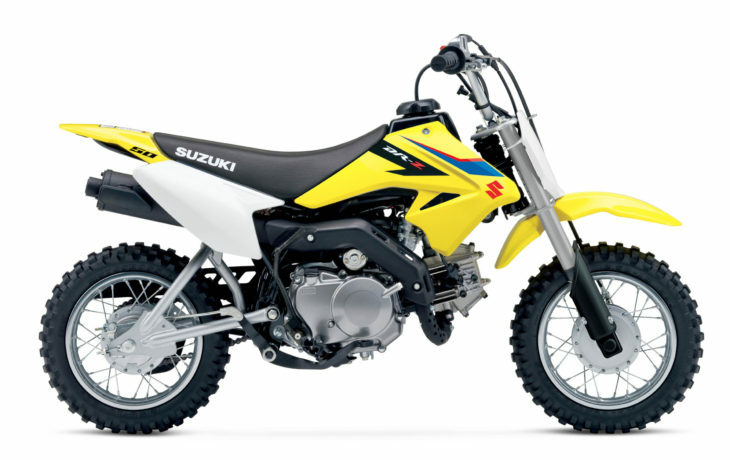 Somewhat dismayed at where Suzuki is off-road wise. Would love to see a good YSF/WR/CRFX 250/350 trail bike offering. A DR400 is not a valid trail machine, and everyone does not need a KTM450 XC-W racer (I have one, so I can say it). Everything OK about this Suzuki, except of front fork. Looking on the pictures I supose, that’s the same solution, as used for a long time in many small bikes of different brands: tiny tubes with greased coil springs inside and no oil / air damping at all. It was up to date 50 years ago and more, or less sufficient for today until the kid is slow and rides on flat places. Getting faster it gets dangerous on even small bumps. For the beginners it’s not necessarily to use so serious solutions as per present KTM SX 50 Mini, but archaic front end in Suzi should be definitely change on at least clasic fork with oil damping. The rest, including drum brakes is ok for “level one” learning ride. This is for the kids who don’t like Honda, okay? What a neat little scoot! I had a JR50 as a kid. I bought my son a new JR50 in 2002. I wait ALL this time for a fresh idea, and all i get is an old Honda 50 design? That’s the best you could do Suzuki? As a Suzuki guy, total bummer. Hey, it’s got inverted forks and a monoshock and it looks great. My grandson will be getting air in a week. And I think the price is right. The Chinese Honda clones have been around for decades now and they are reliable. Unless you plan on going the KTM route to make a pro out of your next seven year old, I think this is fine. I’m genuinely perplexed. What other features would be possible at a price a parent would be willing to pay for a bike the child will physically outgrow in about a year? Launch control? Selectable engine maps? It’s designed to teach the kid how to ride, not win the ISDE.